This is a favorite dish of mine. And it’s “showpiece” for great wine. The recipe itself I took from Food Network’s Giada DeLaurentis. It is simple to follow and is textbook example of a great dish not needing to be overly elaborate or complicated to prepare. With regard to the wine selection… it always good to pair a regional food dish with wines that would be “local”, or at least from the same country. But more fun is going outside region and country to wines that still pair admirably. Or in this case, maybe it’s just because I love Burgundy, both red and white, that I look for reasons to open bottles! 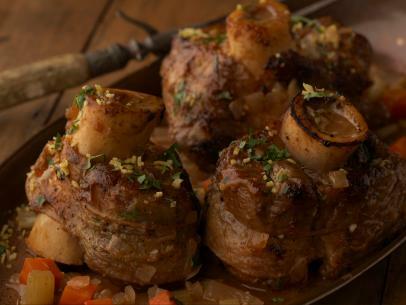 And Osso Bucco provides an opportunity to open up either full flavored whites, or elegant reds. For me, Burgundy was an easy call, and I opened a bottle of each. Nebbiolo based reds like Barbaresco or Barolo would also be great, as would be a balanced Pinot Noir. Alternative whites… Vernaccia or Viognier. Winemaking at Domaine Marius Delarche is now in the hands of Étienne Delarche (son of Marius), who is recognized as one of the young “Turks” of Burgundy. He is taking the great wines of the Domaine to even loftier heights of quality. The Domaine is centered in Aloxe-Corton, with holdings in Grand Cru, 1er Cru & Villages, in Aloxe-Corton and adjacent Pernand-Vergelesses. This is extremely pretty Pinot Noir that wakes up the taste buds in the most delightful way. This is a great value, medium bodied with awesome fresh alive clean fruit and insane length on this wine for its price point. Packed with minerals, chocolate, white flowers and a good measure of sappy and pure Pinot fruit. What especially impressed us was its bottomless juicy core—lots of concentration but not weight, which makes it a serious pleasure to drink. The effortless balance of stony notes and spices is a nod to the family’s impressive vineyard terroir. The wines of Domaine Paul Pillot are recognized as some of the finest in White Burgundy today. The Domaine is 13ha divided among several climats in Chassagne-Montrachet, Saint-Aubin and Santenay. Pillot is one of just five producers in 1er Cru la Grande Montagne, the others being Domaine Bachelet-Ramonet, Domaine Fontaine-Gagnard, Domaine Lamy-Pillot and Olivier Leflaive. Total production levels are among the smallest in all of Chassagne-Montrachet. The vineyard of la Grand Montagne is right at the top of the Chassagne appellation. This is admirably elegant and pure with a lovely nose of cool white flower, white peach and pear, all of which are liberally sprinkled with wet stone nuances. There is good punch and superb delineation to the racy, linear and impressively complex flavors that culminate in a racy, linear and attractively stylish finish. Good juice here that will round out with time. Place the rosemary, thyme, bay leaf and garlic into cheesecloth, and secure with twine. This will be your bouquet garni. In the same pot, add the onion, carrot and celery. Season with salt at this point to help draw out the moisture from the vegetables. Sauté until soft and translucent, about 8 minutes. Add the tomato paste and mix well. Return browned shanks to the pan and add the white wine and reduce liquid by half, about 5 minutes. Add the bouquet garni and 2 cups of the chicken stock and bring to a boil. Reduce heat to low, cover pan and simmer for about 1½ hours or until the meat is falling off the bone. Check every 15 minutes, turning shanks and adding more chicken stock as necessary. The level of cooking liquid should always be about ¾ the way up the shank. Carefully remove the cooked shanks from the pot and place in decorative serving platter. Cut off the kitchen twine and discard. Remove and discard bouquet garni from the pot. Pour all the juices and sauce from the pot over the shanks. Garnish with chopped parsley and lemon zest. n.b. You can use red wine and beef broth instead of white wine and chicken broth. I doubled the veggies.